Update your living room with this modern chair and ottoman set. 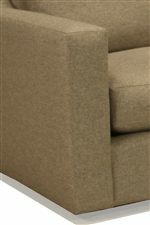 Elegant and up-to-date, this chair features plush cushions to keep you comfortable, and sleek contemporary track arms. The gentle curve of the shaped chair back offers cool contemporary views from any angle. The matching ottoman features casters at the base for mobility. The 1191 Contemporary Chair and Ottoman with Casters by McCreary Modern at AHFA in the area. Product availability may vary. Contact us for the most current availability on this product. 1191-CAB Chair 1 37" 43" 36"
1191-OCB Ottoman with Casters 1 21" 29" 17"